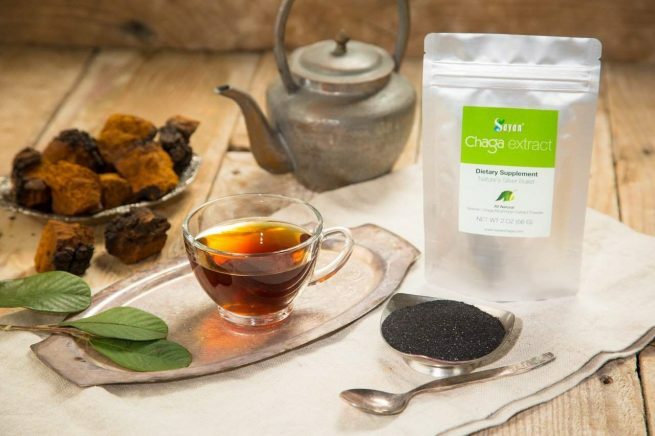 Experience astonishing chaga extract benefits with our Siberian Chaga Extract Powder. 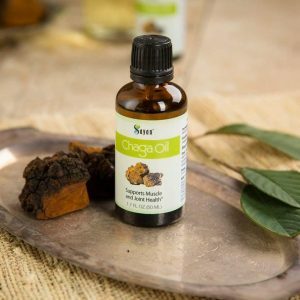 Containing absolutely no fillers or hidden bulk by-products, we’ve concentrated a collection of all the active ingredients released by the chaga mushroom when we processed it. The result is a high-powered, water-soluble chaga mushroom extract with high ORAC value and immune system support properties. * Use it daily in yogurt, milk, smoothies, juice, or hot water. 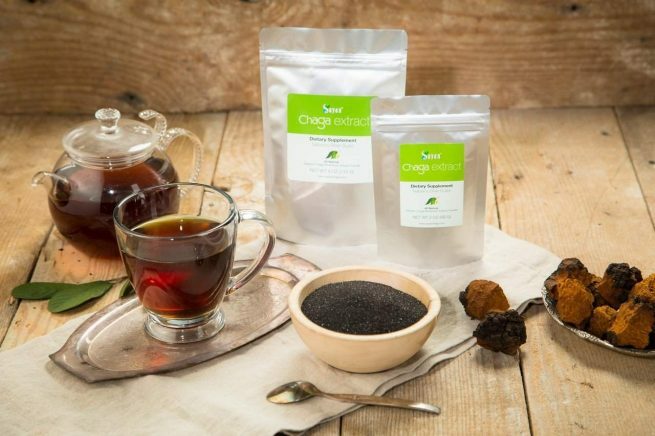 Chaga’s purifying properties were first documented in Chinese traditional medicine thousands of years ago, and it has been celebrated in Siberian folklore medicine for centuries. 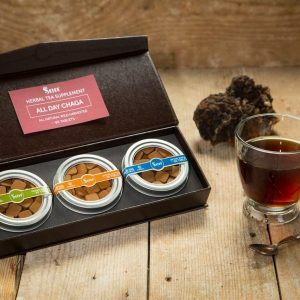 The preferred route of consumption has been a soothing, woodsy tea made by steeping the raw mushroom in hot water. People still drink it daily in Siberia to improve their health and longevity. Not all chaga extract powder is created equal – there’s a science behind producing the purest and most potent extracts. An independent lab, Brunswick Laboratories, determined that our chaga extract has an ORAC value of 153,200 micromoles of Trolox Equivalents per 100 grams (molTE per 100 g). 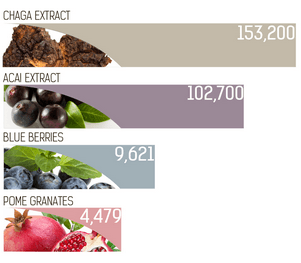 Compare this to acai extract at 102,700 molTE per 100 g, blueberries at 9,621, and pomegranates at 4,479. As the creator of the first chaga beverage in 2007, we are actively and constantly researching the benefits of chaga using different methods. Our chaga extract is very potent. The extraction rate is 16%, which means for every 1 kg of raw chaga, we produce 160 grams of extract. In other words, we process 6.25 lbs of raw chaga to produce 1 lb of chaga extract powder. The secret to chaga’s immune-boosting power is in a chemical structure known as “chromogenic complex.” The chromogenic complex is measured as a percentage of polyphenols, which are the molecules that dissolve in water first (40–45%) during the chaga extraction process. Polyphenols are responsible for the extract’s dark color, and aid in absorption. 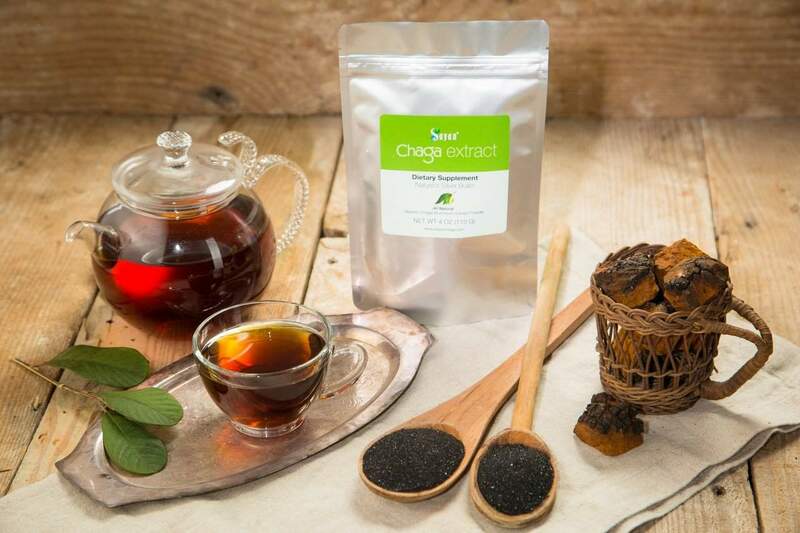 It is very important to understand why chaga extract with 12–13% polysaccharides qualifies as a high-quality chaga extract. For more detailed info on chromogenic complex, quality chaga extract powder processing methods, and polysaccharides, check out our FAQ. 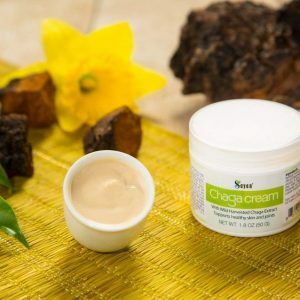 Why Choose Sayan Health Chaga Extract Powder? 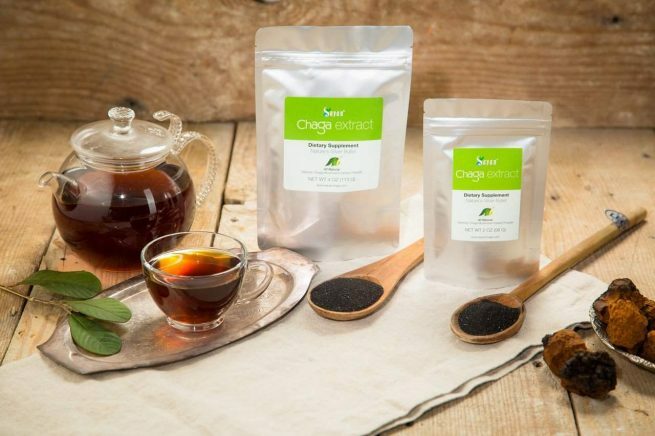 As the developer of the first raw chaga beverage, Sayan Health is dedicated to producing only the most potent, high-quality chaga mushroom extract powder on the market. Ever since 2007, we’ve used our proprietary technique to prepare raw chaga for a low-pressure hot water extraction method with subsequent freeze-drying process, to ensure our product is optimized with the most essential nutrients. We’ve been asked numerous times what the difference is between chaga produced through water extraction versus alcohol extraction, so we created the table below to explain. All studies that have been conducted by chaga mushroom scientists have used chaga extract powder produced by water extraction. To date, there is no scientific proof that chaga extract produced by alcohol extraction is superior to chaga extract produced by water extraction. But if you’re only looking for chaga extract produced by alcohol extraction or a mix of alcohol and water extraction, before purchasing such a mix, it’s a good idea to ask about the ratio between the two. At Sayan Health, we believe that chaga produced by water extraction is far superior and proven by time. Thus we only offer Siberian Chaga extract powder produced by water extraction with a sublimation freeze-drying process. We believe in the merits of both hard science and holistic health, and present to you a formula based on scientific research with no false claims. For any questions about the benefits or production of chaga, our chaga experts are always ready to give you answers and steer you toward impeccable health. Ingredients: Whole Chaga Mushroom (Innonotus obliquus) Extract Powder. Daily supplement use: 0.07 – 0.10 oz (2-3 grams, or about half a teaspoon) of powdered Chaga extract mixed with your favorite beverage to be taken daily. Daily Supplement Intense use for individuals wishing to improve a certain health condition, such as a cold, a respiratory or a digestive problem, etc. : 0.25 – 0.35 oz (7-10 grams, or about 1.5 – 2.0 teaspoons) of powdered Chaga extract, to be taken daily. 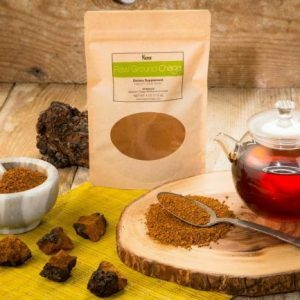 Raw, pure Chaga has an acquired taste – it may even seem bitter as it has a lot of herbal flavor. If the herbal flavor of Chaga is too strong and makes it difficult to ingest, add some sweetener such as honey or sugar to suit your individual preference or use more liquid (we also find that beverages with lots of flavor could mask the herbal note of Chaga very well). Please note that the daily dose can be split in half or even three or four equal portions, to be taken throughout the day. Also if you start with Daily Supplement Intense dose we advise to increase serving size gradually, for example start with 0.07 – 0.10 oz (2-3 grams, or about half a teaspoon) and then increase serving size to 0.25 – 0.35 oz ( 7-10 grams, or about 1.5 – 2.0 teaspoons ) in 7-10 days. For best results, take a 5 – 7 day break from taking Chaga extract powder every 24 – 28 days. In other words, use it for about a month, stop for a week, and then use it for another 4 weeks, and so on. Caution: Avoid consuming chaga extract powder if you are currently taking penicillin or intravenous injections of glucose, in case of adverse interactions or side effects. Amazing product and great quality! It’s a very good tea with wonderful aroma but I love the energy it gives without caffeine! 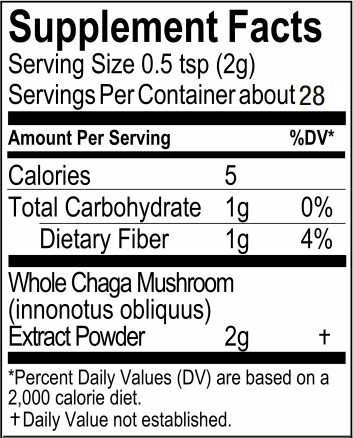 I like the taste and convenience of this chaga mushroom powder but it clumps up in the cup, it requires straining to drink, does not dissolve easily. But I would order this product again in the future as I experienced the benefits of this amazing product.